The Earth’s magnetic field is the magnetic field that surrounds the Earth. It is sometimes called the geomagnetic field. The Earth’s magnetic field is created by the rotation of the Earth and Earth's core. It shields the Earth against harmful particles in space. The field is unstable and has changed often in the history of the Earth. The magnetic field creates magnetic poles that are near the geographical poles. A compass uses the geomagnetic field to find directions. Many migratory animals also use the field when they travel long distances each spring and fall. The magnetic poles will trade places during a magnetic reversal.As the Earth spins the two parts of the core move at different speeds and this is thought to generate the magnetic field around the Earth and make it seem to have a large bar magnet inside it. The Earth’s geomagnetic field is created because of two things. 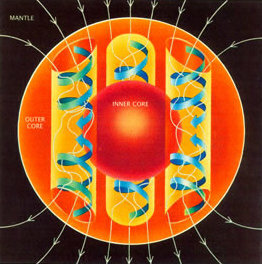 The convective motions in the liquid conducting core inside the center of the Earth are important for making the magnetic field. When the convective motions occur with the electrical currents around the Earth, the magnetic field is created. The Earth’s rotation is what keeps the magnetic field up. The interaction between the convective motions and the electrical currents creates a dynamo effect. The intensity of the magnetic field is greatest near the magnetic poles where it is vertical. The intensity of the field is weakest near the equator where it is horizontal. The magnetic field’s intensity is measured in gauss. The magnetic field has decreased in strength through recent years. In the past twenty-two years, the field has decreased its strength 1.7%, on average. In some areas of the field, the strength has decreased up to 10%. The fast strength decrease of the field is a sign that the magnetic field might be reversing. The reversal might happen in the next few thousand years. It has been shown that the movement of the magnetic poles is related to the decreasing strength of the magnetic field. A geomagnetic reversal is when the north magnetic pole and south magnetic pole trade places. This has happened a few times throughout the Earth’s history. The magnetic reversal happens after the strength of the field reaches zero. When the strength begins to increase again, it will increase in the opposite direction, causing a reversal of the magnetic poles. The time it takes the magnetic field to undergo a reversal is unknown, but can last up to ten thousand years. The Earth’s magnetic reversals are recorded in rocks, especially in basalt. Scientists believed that the last geomagnetic reversal occurred 780,000 years ago. This figure shows the magnetosphere blocking solar wind caused by the sun. The magnetosphere is created by the magnetic field. It is the area around the Earth that acts as a shield against the harmful particles in solar wind. The magnetosphere has many different layers and structures, and solar wind shapes each of these layers. The interaction of solar wind and the magnetosphere also causes the Northern and Southern Lights to appear. 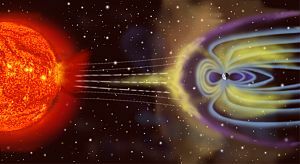 The magnetosphere is very important in protecting the Earth against solar storms which increase solar wind activity. Solar storms can cause geomagnetic storms which sometimes have serious affects on the Earth. The areas in between the north and south magnetic poles are the magnetic field lines. These lines leave the Earth from the vertical point of the South and reenters through the vertical point of the North. These two vertical points are called magnetic dip poles. The magnetic dip poles are commonly referred to as the magnetic poles. The magnetic poles intersect the earth at two points. The north magnetic pole intersects the Earth at 78.3 N latitude and 100 W longitude. This places the north magnetic pole in the Arctic Circle. The south magnetic pole intersects the Earth at 78.3 S latitude and 142 E longitude. This places the south magnetic pole in Antarctica. The magnetic poles are also where the magnetic fields are the strongest. The North Magnetic Pole is the point on the surface of Earth's northern hemisphere where the planet's magnetic field points vertically downwards. There is only one place where this occurs, near to (but distinct from) the Geographic North Pole. Its southern hemisphere counterpart is the South Magnetic Pole. Since the Earth's magnetic field is not exactly symmetrical, a line drawn from one to the other does not pass through the geometric centre of the Earth. The North Magnetic Pole moves over time due to magnetic changes in the Earth's core. In 2001, it was near Ellesmere Island in northern Canada at . As of 2015, the pole is thought to have moved east beyond the Canadian Arctic territorial claim to . The Earth's North and South Magnetic Poles are also known as Magnetic Dip Poles, referring to the vertical "dip" of the magnetic field lines at those points. Earth does change its magnetic poles every million years (plus or minus 250,000 years). Before a change of magnetic field, the Earth's magnetic field becomes weaker and moves around, like a spinning top would before it falls. The Earth has already had hundreds of changes (flip flops). Scientists know this as a result of studies of magnetism on the sea floor, near the mid-Atlantic ridge. The lava slowly moves out of this crevasse (gap in the sea floor) and then it cools with its iron oxide molecules all pointing in the new direction of the Earth's magnetic field. We can look at the history of this magnetic field today to look back at the many flips in the past. Reversals occur at intervals from less than 0.1 million years to as much as 50 million years. The most recent geomagnetic reversal, called the Brunhes–Matuyama reversal, occurred about 780,000 years ago. Another global reversal of the Earth's field, called the Laschamp event, occurred during the last ice age (41,000 years ago). However, because of its brief duration it is called an "excursion". Animals which take long migrations may depend on the magnetic field for a guide. Some migratory animals know their locations by the intensity of the field. They know the time because of circadian rhythms the field produces. Migratory animals are born with a magnetic map in their head that allows them to migrate great distances safely. Their ability to sense the magnetic field is because of magnetic particles. Other animals have a chemical compass based on a radical pair mechanism. 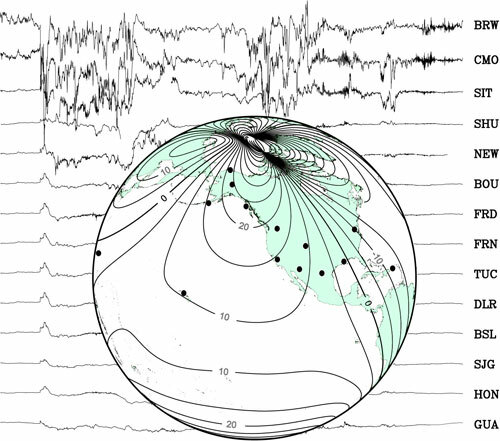 Background: a set of traces from magnetic observatories showing a magnetic storm in 2000. 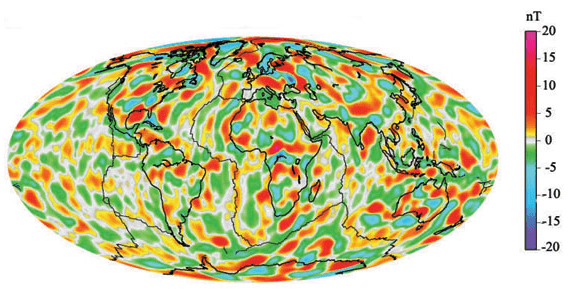 Globe: map showing locations of observatories and contour lines giving horizontal magnetic intensity in μ T.
A model of short-wavelength features of Earth's magnetic field, attributed to lithospheric anomalies. Earth's magnetic field Facts for Kids. Kiddle Encyclopedia.